After two years with her only living relative, Astra Everson is ready to return to the town of her childhood and live on her own. But she finds it necessary to sneak away from her cousins control while the family is away. A chance encounter on the train brings Charles Cameron into her life just in time for Christmas. He helps her get reestablished in town, but he lacks the faith that is so important to Astra. Up against scheming sisters and unscrupulous cousins, can Charles and Astra see their way to a future together? GRACE LIVINGSTON HILL (1865–1947) is known as the pioneer of Christian romance. Grace wrote over one hundred faith-inspired books during her lifetime. When her first husband died, leaving her with two daughters to raise, writing became a way to make a living, but she always recognized storytelling as a way to share her faith in God. She has touched countless lives through the years and continues to touch lives today. Her books feature moving stories, delightful characters, and love in its purest form. Grace Livingston Hill began writing stories in 1877 at the tender age of twelve and didn’t stop until her death in 1947. But what may be more amazing is that she has sold over 84 million copies and is still loved by young and old alike. 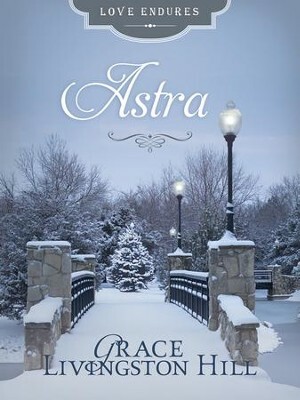 I'm the author/artist and I want to review Astra - eBook.